London is renowned as a multi-cultural and multi-national global city. The population of the city is changing and expanding relentlessly, with new arrivals coming here every day to work and enjoy living in one of the most vibrant cities in the world. One thing that these new visitors inevitably underestimate is the amount of walking that a typical Londoner undertakes each day. It is not unusual to walk 30 minutes to and from work per day and the pace of walking on London footpaths tends to be akin to Olympic race walking! Add to this the amount of stairs that you must climb up and down to get to the tube platforms and out at the other end and the leg muscles can very soon become very tight. Over time this tension can lead to hip pain and knee pain developing. This seems to mostly affect newer arrivals to the city, particularly when coming from places where so much walking is less commonplace, but it can really affect anyone who walks a lot. Patients will complain of pain at the front of the hip and/or knee. Often it will be painful going up and down stairs, standing from sitting and on walking. 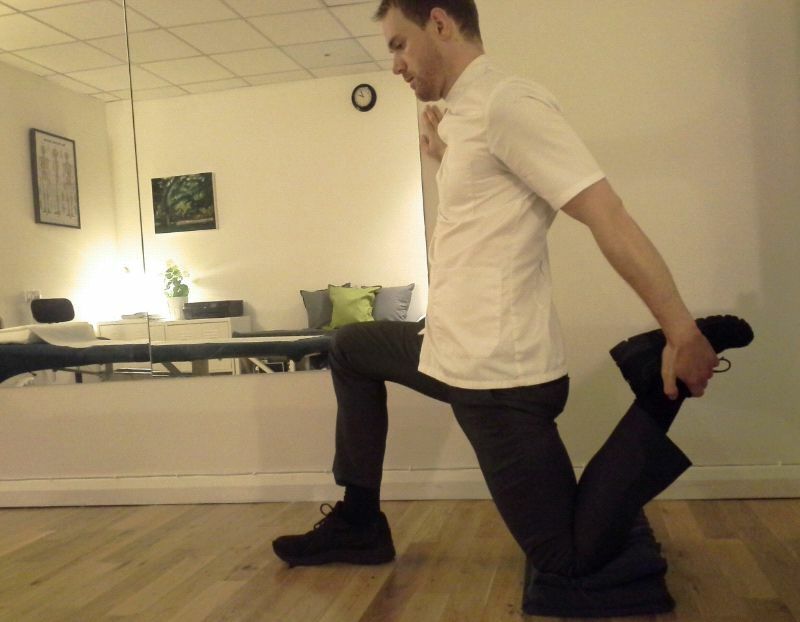 On examination, the quadriceps muscles at the front of the thigh will be very tight and the areas around the knee cap and at the front of the hip will be painful to touch. These clinical findings can indicate a quadriceps tendonitis at the front of the hip and the knee cap where the muscle attaches at either end of the thigh. Inflammation can develop here due to the prolonged tension in the muscle. In order to relieve your hip and knee symptoms, two steps must be taken. First, the inflammation must be brought under control and second, the muscles must be stretched to remove the traction at the attachment points. Icing the knee and front of the hip for ten minutes per hour in the evening can really help to relieve the inflammation, as can anti-inflammatory gel from a pharmacist. Most people stretch the quadriceps standing, which is not a very effective way to stretch the muscle group as it only really targets three out of four of the muscles in the group. Follow the instructions below to perform a very effective quadriceps muscle stretch. Hold onto something stable (such as a wall) with one hand for balance and take hold of the back foot with the other. Pull the foot upwards towards the back of the thigh gently until you can feel some tension at the front of the thigh. Then push the hip forward into a lunge movement. This will really enhance the stretch. Hold the stretch for 30 seconds, release, then hold for another 30 seconds. The stretch should never be painful. If it is then ease off a little, you don’t want to aggravate your injury. If it is too painful to stretch or if there is not a significant improvement after one week then see your Osteopath for treatment. Happy walking, I hope that this advice can keep your hips and knees in good working condition throughout the winter and beyond!